“There are sometimes drug gangs in the park, but not in this part,” said my guide Jorge Salaverri, as our beat-up Jeep bumped along a dirt track towards the entrance to Parque Nacional Pico Bonito. “The gangs only ever come here to dump bodies. Tourists get scared when they see them, but nobody is actually killed here.” The strange thing was that after a week in Honduras – dubbed the most violent country on Earth – Jorge’s less-than-reassuring statement actually provided some comfort. Home to the spectacular Mayan ruins of Copán, deserted palm-fringed beaches, picturesque Caribbean islands, some of the world’s least expensive diving, and expanses of wildlife-rich rain and cloud forests, Honduras should be an easy sell. Unfortunately, in recent years violence has risen dramatically thanks to the activities of drug traffickers using Honduras as a stop-off between South America and the US; the city of San Pedro Sula reportedly has the highest murder rate in the world outside of a war zone. The tourist industry, needless to say, has taken a real hit. 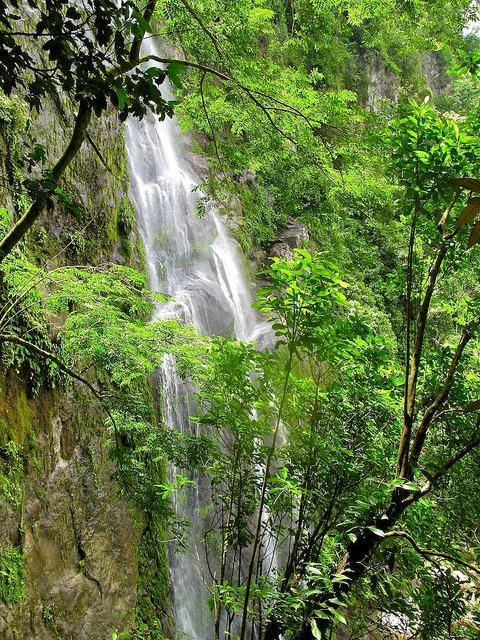 However, despite serious security risks for tourists, it is possible to visit parts of Honduras safely, and the silver lining to the country’s pitch black cloud is that those travellers who do make it over have world-class attractions like Parque Nacional Pico Bonito virtually to themselves. In northern Honduras, the park is a dramatic series of forested hills and jungle-clad mountains, interspersed by plunging waterfalls that feed 20 different rivers. 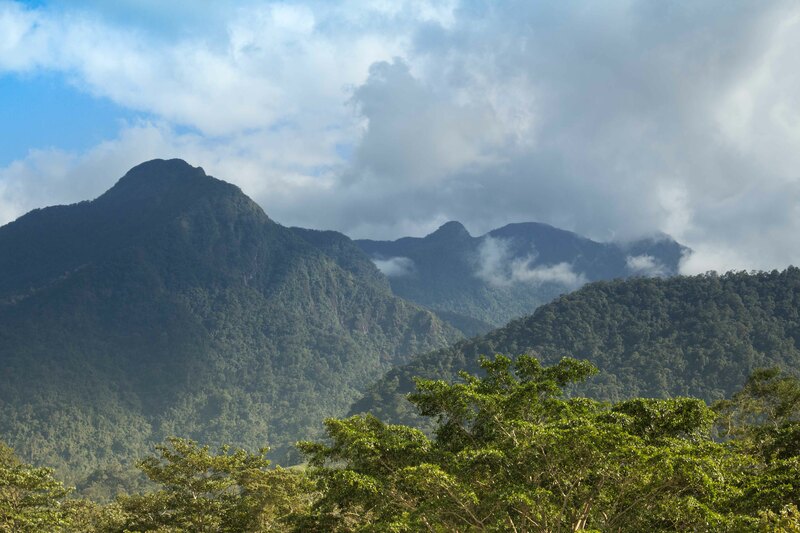 Covering an area of almost 565 square kilometres, it is dominated by the soaring 2346m-high peak of Pico Bonito and has an abundance of wildlife. Jorge and I arrived at the park entrance – a rickety chain bridge stretching over the churning Río Cangrejal, which has some of the finest white water rapids in Central America – without spotting any dead bodies. But neither were there any tourists: the nearby lodges and resorts – each with an unspoilt riverside setting – were all empty. Once inside the park my lingering concerns about encountering drug gang members (maras) soon melted away. Jorge, after all, is one of the top guides in Central America, and has worked on TV documentaries with the likes of Bear Grylls, and Ray Mears. He’s also a former Honduran Special Forces soldier. The day’s aim was to reach the top of the Bejuco waterfall – a stiff two-and-a-half-hour climb – which cascades down over 700m through the forest to the river below. Jorge led the way, swishing his machete to clear a path through the dense greenery. As we climbed higher – stopping periodically to quench our thirst from crystal-clear streams – it was fascinating to note the subtle changes in the flora as lush tropical rainforest gradually evolved into dank and mossy cloud forest. As we progressed up the trail, Jorge paused to point out toxic butterflies with translucent wings, tiny spider monkeys, armadillo tracks on the ground, howler monkeys high in the canopy, and a male yellow-eared toucan (the rarest of the four toucan species found in the park) perched on a nearby branch. Perhaps even more intriguing, however, was the array of trees and plants. The park is home to balsa trees, piercingly sharp razor grass, tough ironwoods, twisted water vines, and rubber trees slashed with crosses out of which white liquid rubber drips like spilt milk. Local indigenous groups collect this sap in banana leaves and use it to make waterproof duffle bags. Some of the trees are edible – such as the almond-flavoured bark of the sapote tree and the bitter pod-like fruits of the wild tamarind – and several have medicinal uses, including the monkey ladder tree, whose bark, when ground up and boiled, is a tonic for the kidneys. Just avoid the camotillo palm, Jorge warned, the roots give you killer diarrhoea. Eventually, after a hard final scrabble, we arrived at the top of the Bejuco waterfall. The wonderfully cool, shady clearing overlooked a shallow pool and a deceptively small stream for such a powerful waterfall. It also offered panoramic vistas of the park: the undulating green Cordillera Nombre de Dios ahead, the river rapids below, and the placid-looking Caribbean Sea in the distance. Jorge laid out a simple lunch on palm leaves – sandwiches, fresh pineapple and super-sweet pineapple juice – and we both sat quietly, listing to the calls, yelps and whistles emanating from the forest and marvelling at the views. The hike back down was a one-and-a-half-hour scramble, a real work out for the knees and thighs. Jorge darted along nimbly while I was left trailing behind, slipping and sliding over the loose earth. As we neared the bridge we passed two local youngsters – skipping school to explore the park – the only people we encountered on the whole hike. The tranquillity of the day in the park, however, provided only a brief escape from the reality of everyday life in Honduras. When I returned to my hotel in the city of La Ceiba, a 30-minute drive from Pico Bonito, the early evening news was on the TV in the lobby: the city’s deputy mayor, it emerged, had just been shot dead as he drove to the airport. The hotel staff didn’t even give the TV a second look – for them it was just another normal day. A version of this article was first published by Rough Guides.